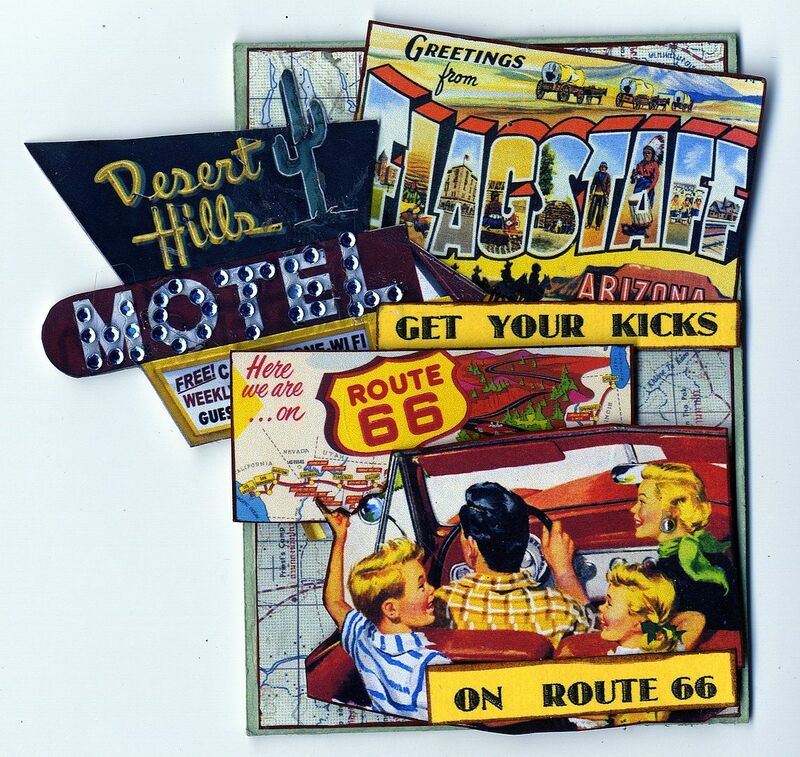 I'm sure some of you are already planning your summer vacation so for inspiration here are a few fun vacation themed ATCs that I received in a swap. 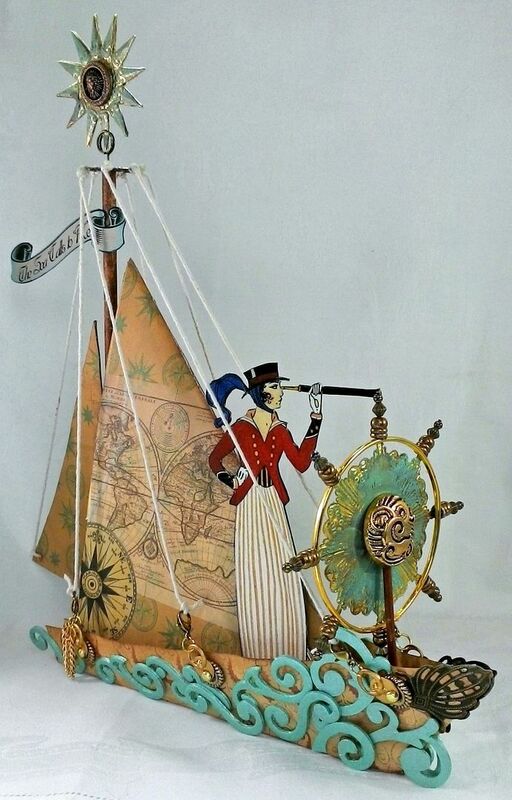 On a dream boat of paper and string. 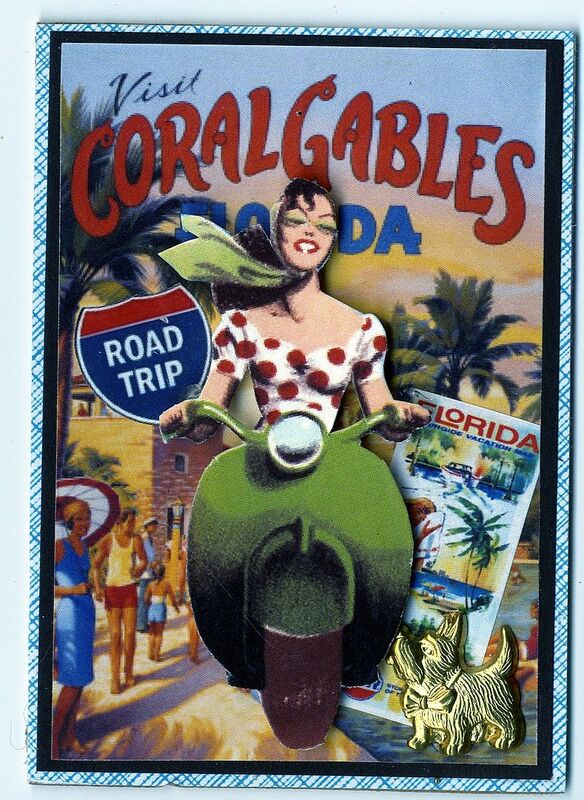 Where mermaids ride waves and sing! 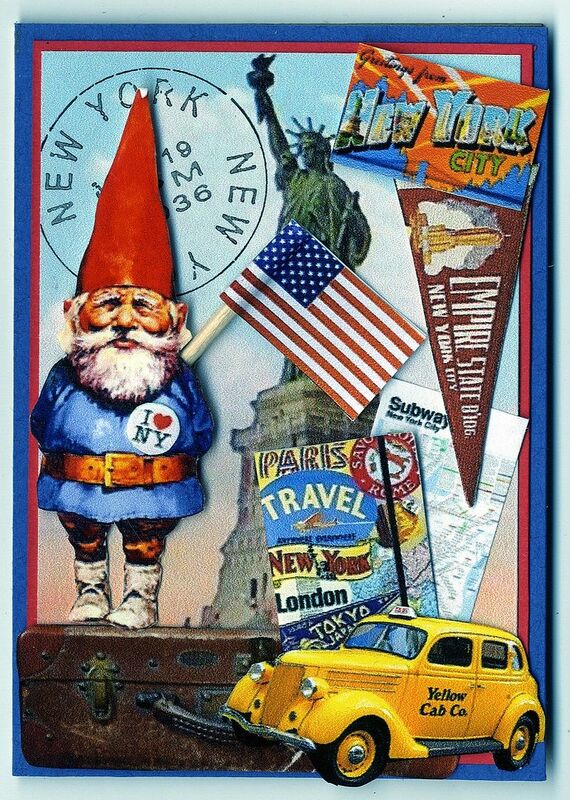 The overall size of the piece is 11½”x 11½”. The teal swirls along the sides of the boat represent the boat slicing through the waves. 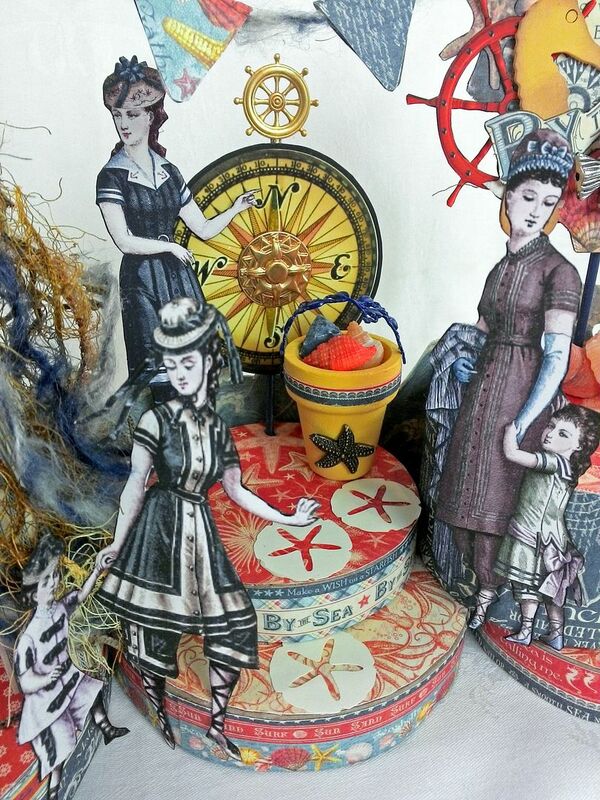 The adventurous ladies on the boat are from my “The Sea Calls to Me” collage sheet. 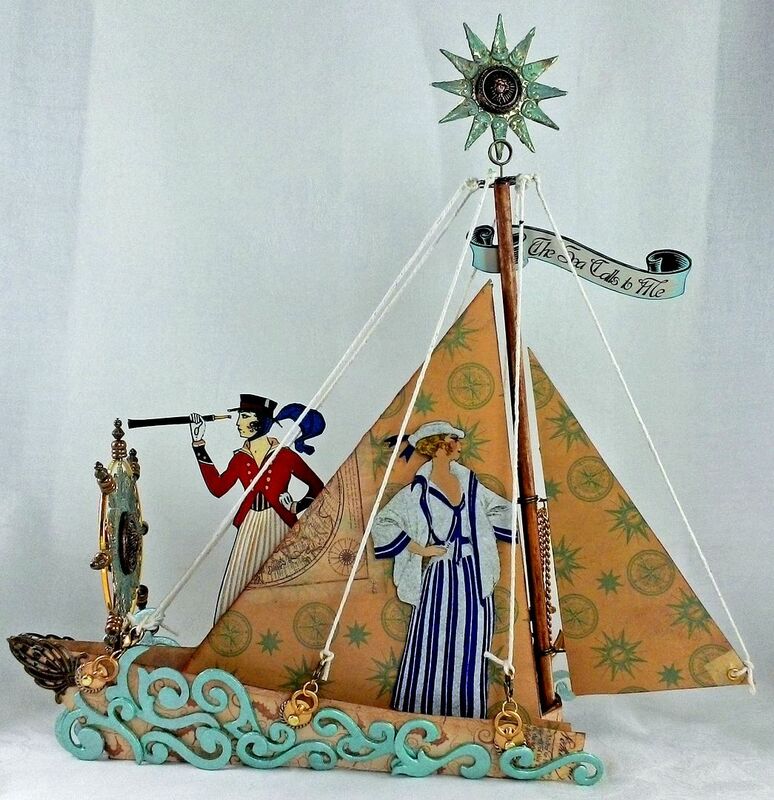 The base of the boat is a paper sailboat which is super simple to make. 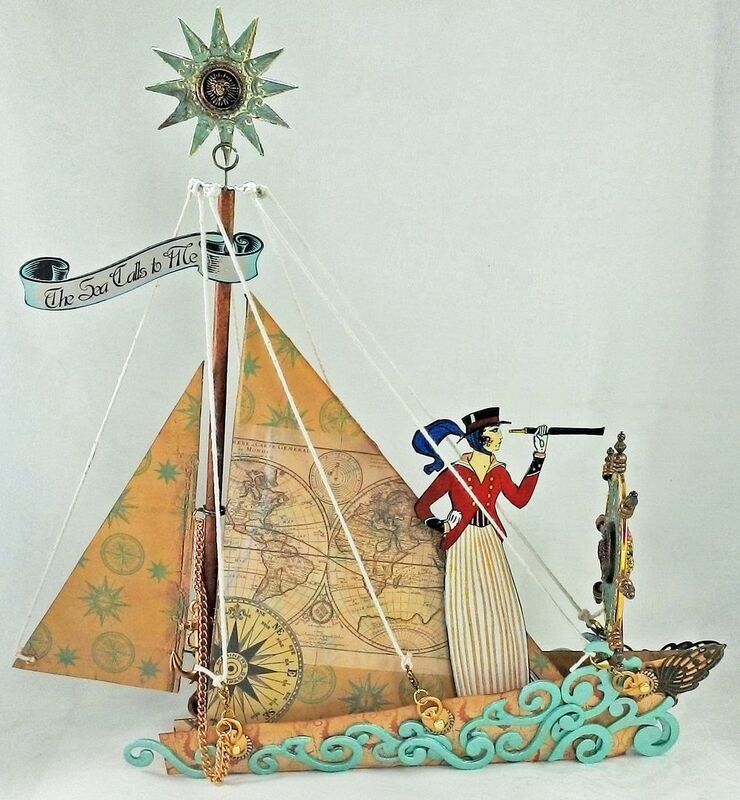 I viewed several how-to videos on YouTube looking for just the right sailboat. 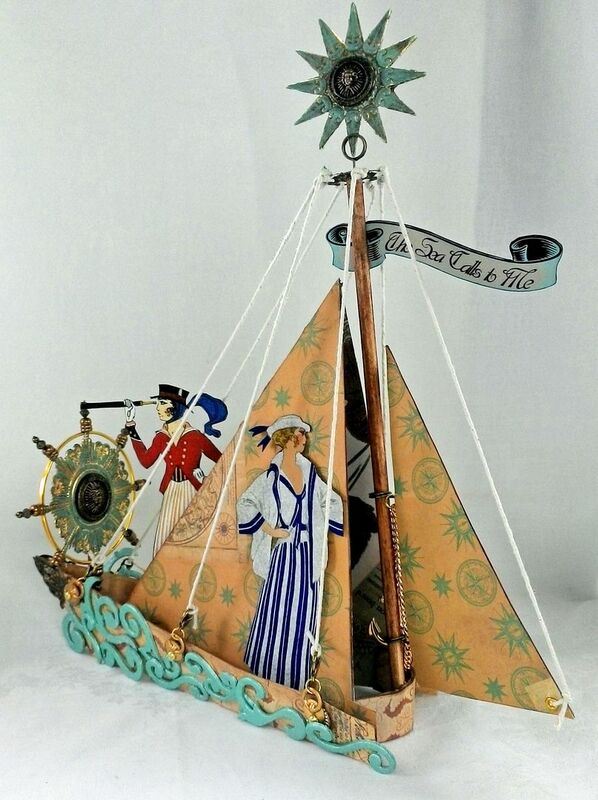 I wanted something that was not complicated and that had a tall sail. The video below by Tavin fit the bill. 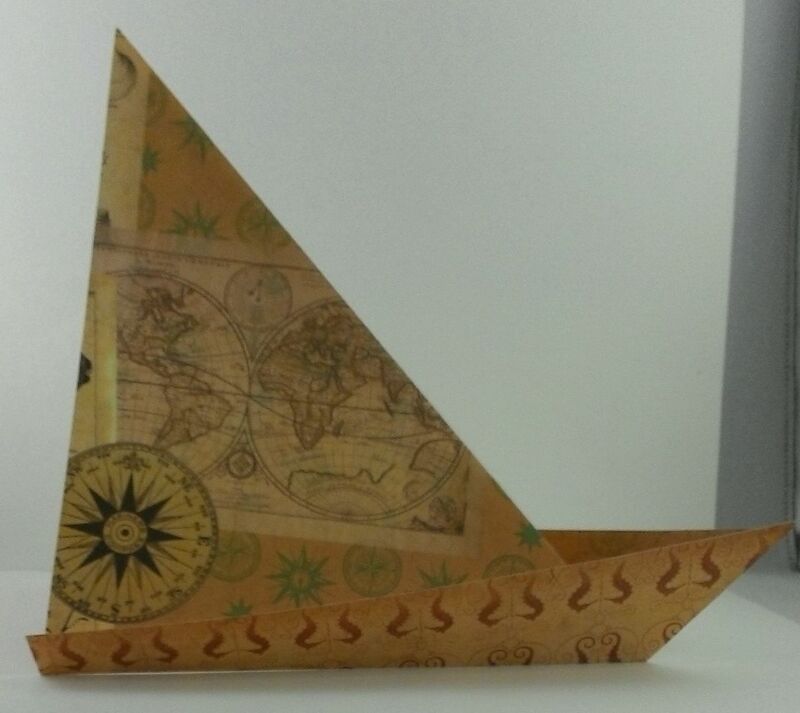 With 3 folds you can create this boat. After watching the video continue through the tutorial where I will cover the rest of the steps. 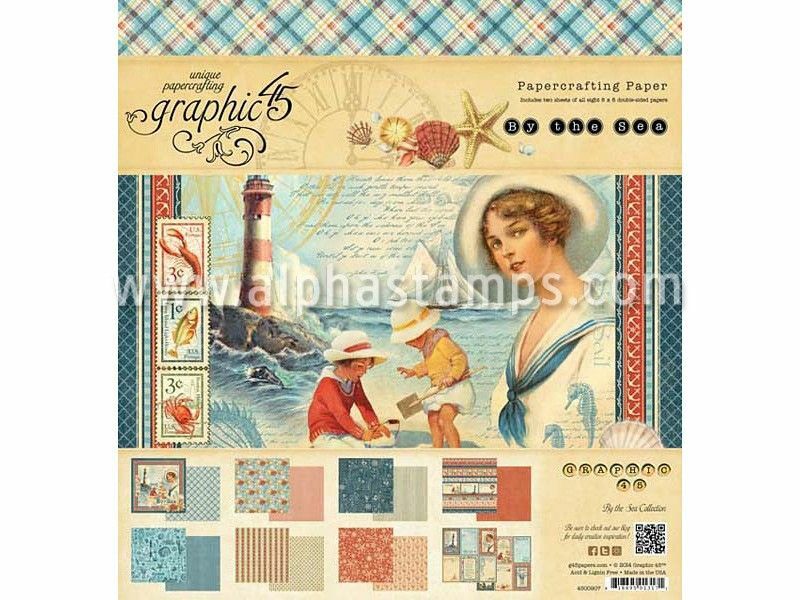 For my boat, I used 12” x 12” double sided patterned paper cut to 10” x 10”. Once the boat was folded I removed some of the paper from the back of the sail. I did this to accommodate an additional sail on the back and the mast. To make the boat sturdier, I added pieces of thin chipboard to the insides of the sail. On one side of the chipboard I added decorative paper. 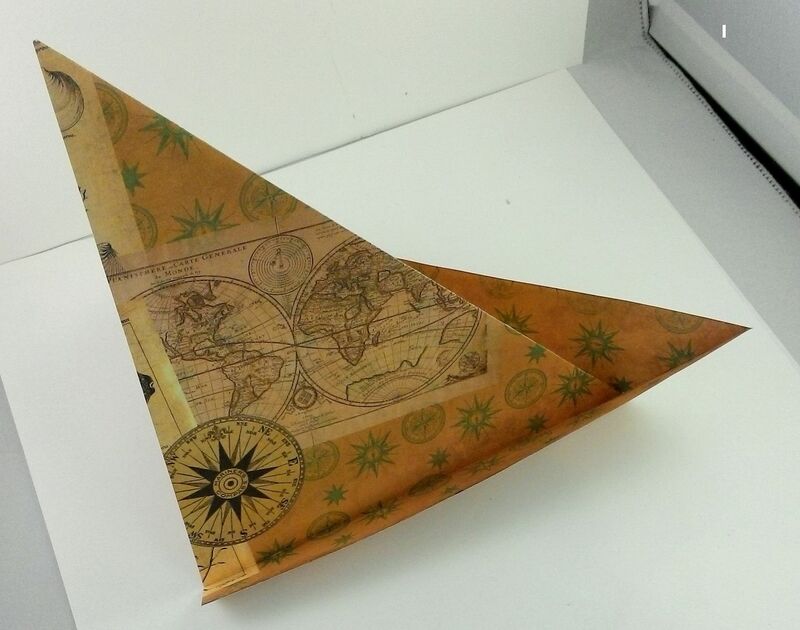 I used the sail as the pattern and cut the chipboard slightly smaller so that it would fit snugly inside the sail. Below you can see how I flattened the boat out and glued the chipboard in place. 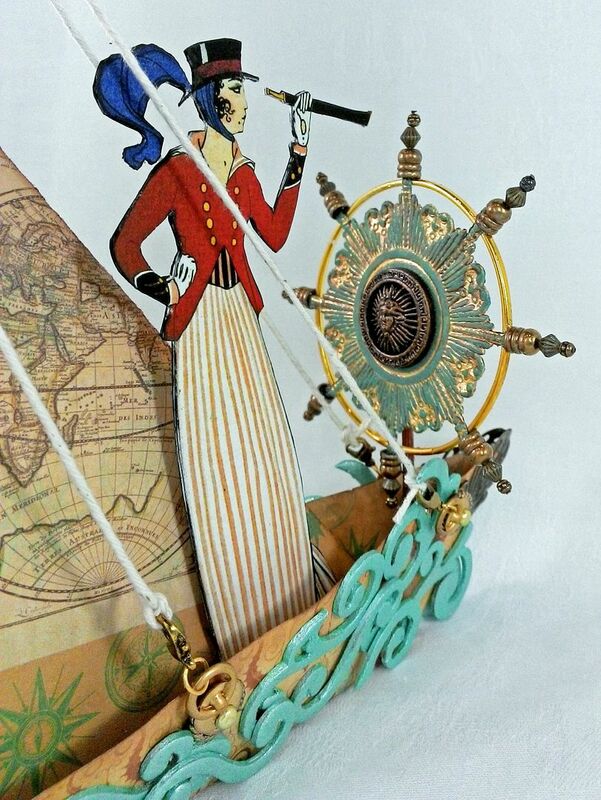 To create the ships wheel, I used a combination of a gold bangle, a gold Dresden Medallion, buttons and other brass bits. There is a complete list of the items I used at the bottom of the post. 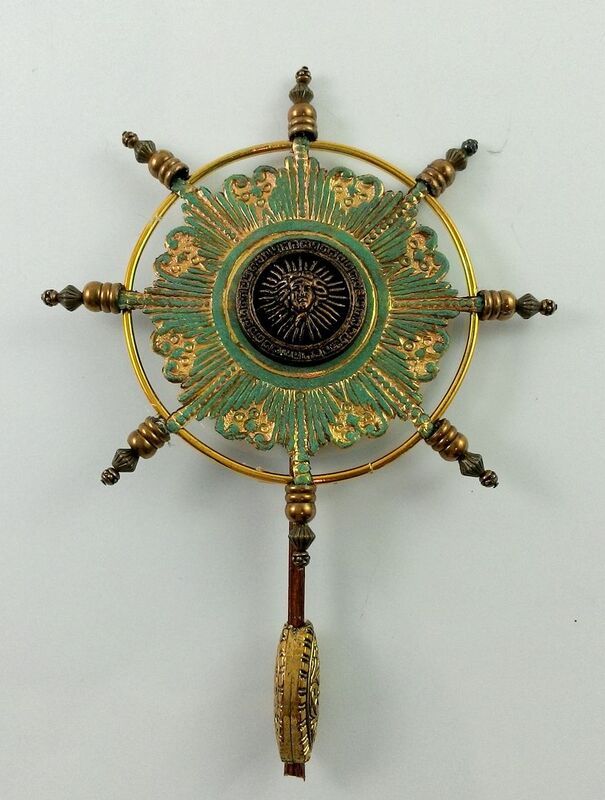 The medallion is colored with Patina Gilder’s Paste. 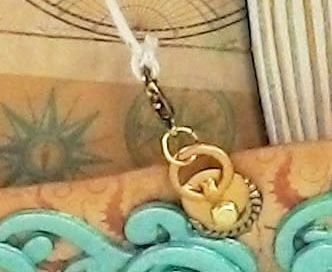 The button is painted black and then colored with Inca Gold Gilders paste( to make the design pop). 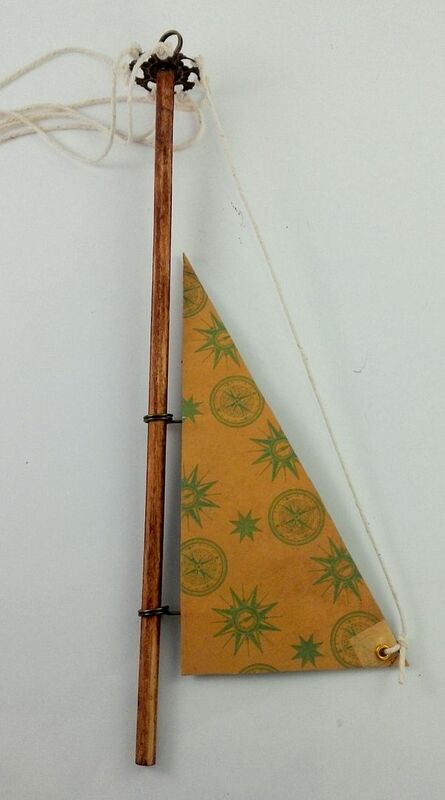 I attached the ships wheel to a wooden skewer and then added a bead to the bottom. The bead gives me a larger surface area to glue the ships wheel in place. Next, I made a mast with a second sail. 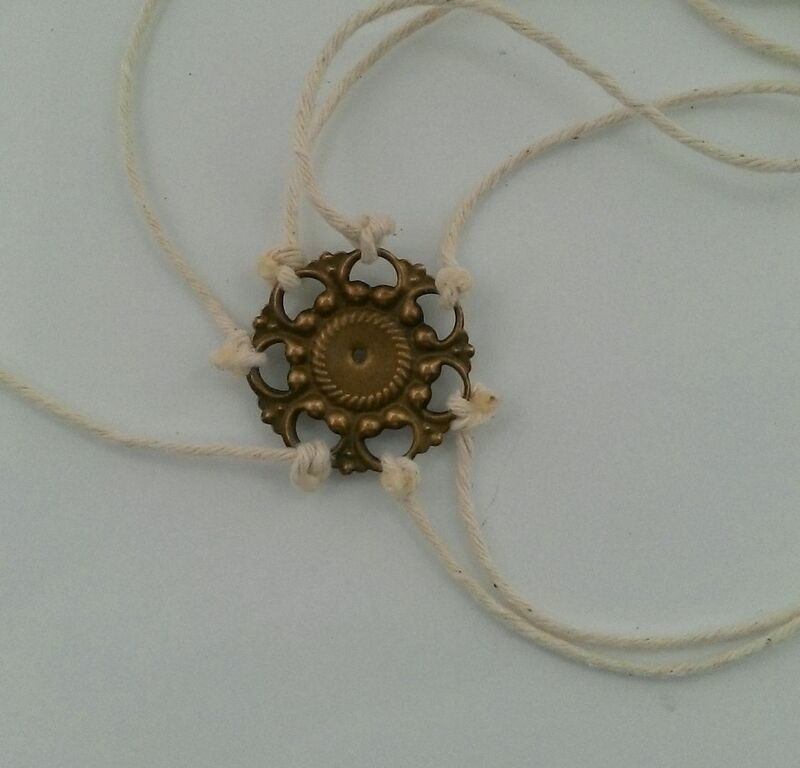 To accommodate the string, I used a piece of brass with holes. I tied 7 strings to the brass; 6 that attach to the main boat and one that holds the small sail in place. I poked a hole in the center of the brass piece. I used a memo pin and glue (E6000) to attach the brass piece to the top of a wooden dowel. I cut my dowel to 9”. I pre-poked a hole in the dowel before inserting the pin. 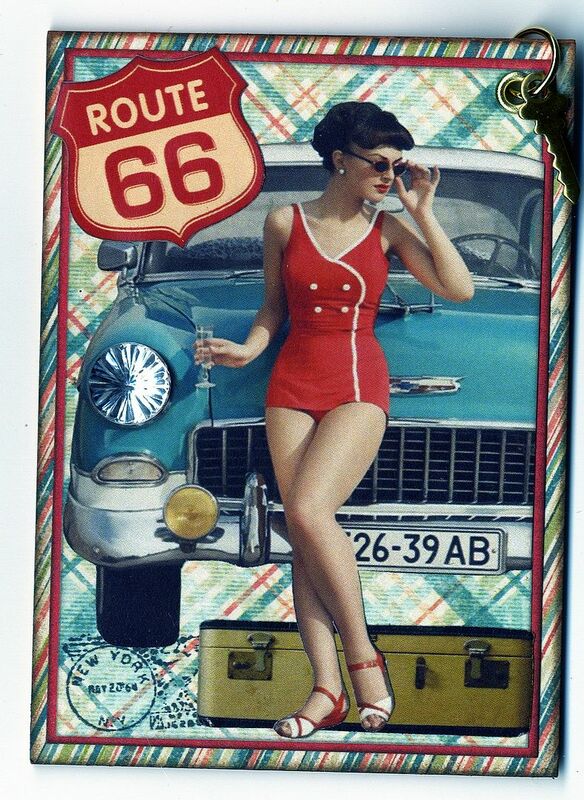 The dowel is stained with Vintage Photo Distress Ink. 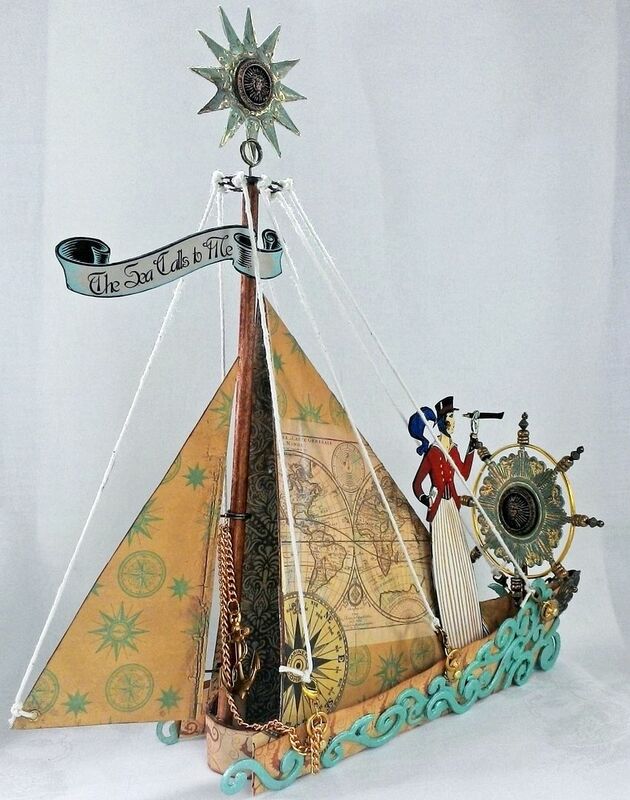 The sail is made from two pieces of decorative paper glued together with two memo pins glued between them. 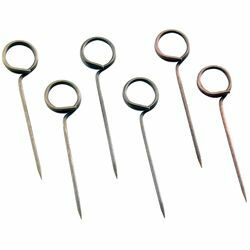 The loop of the memo pins slide onto the dowel. I punched a hole in the sail and added an eyelet. 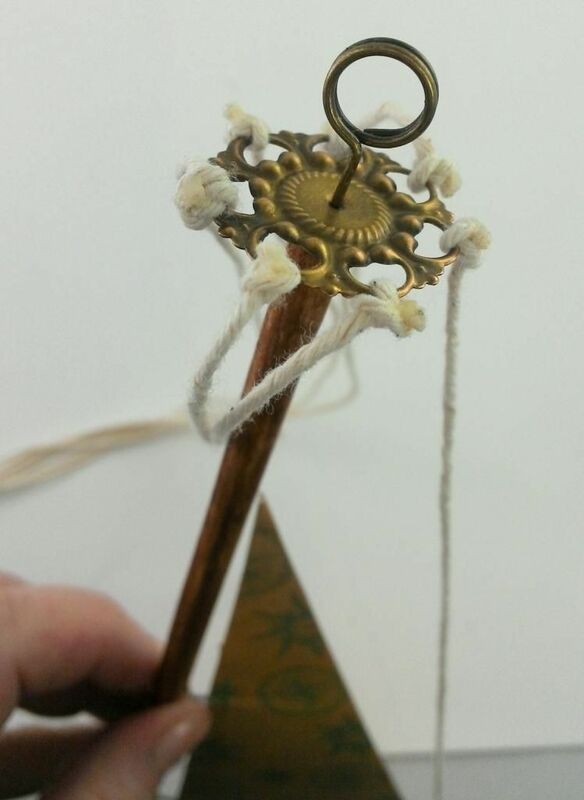 One of the strings from the top is inserted through the eyelet. The string keeps the sail in place and the sail is free to move from side to side. 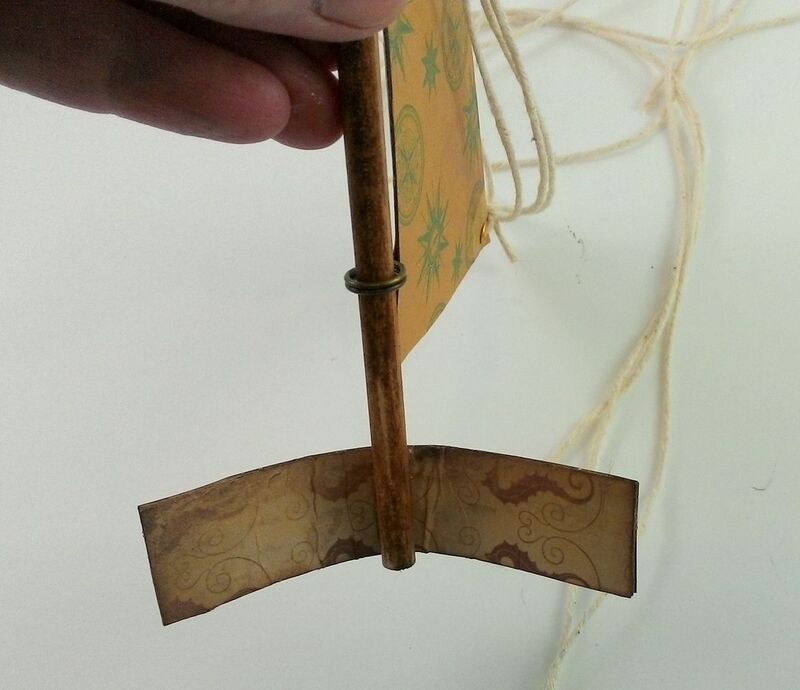 To the bottom of the wooden dowel I glued a piece of light chipboard covered with decorative paper. The piece of chipboard is used to attach the mast to the boat and to keep the back of the boat from opening too far. 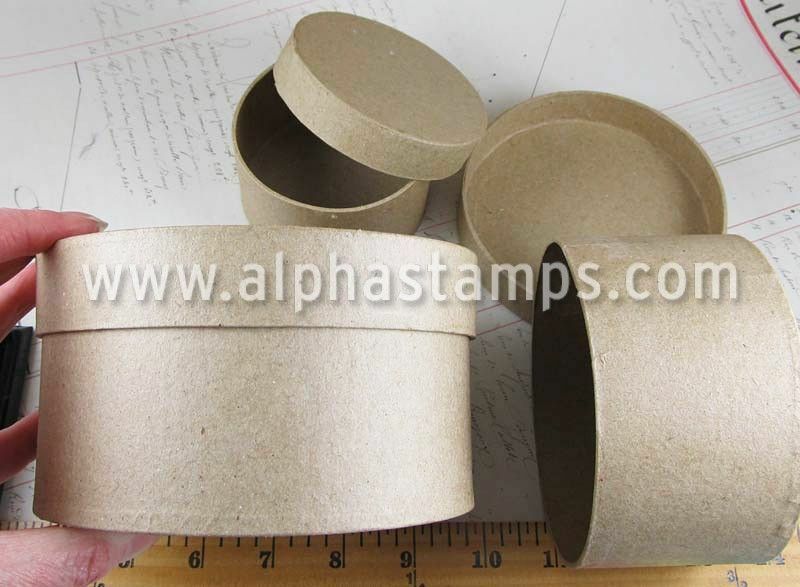 Make the height of the chipboard small enough that you won’t see it from the side of the boat. The width depends on how wide you want the back of your boat to be. In the picture you can see that I curved the chipboard and glued it in place just inside each side of the main sail. One of the great things about the memo pins is that they gave me away to attach the Dresden Star to the top of the mast. 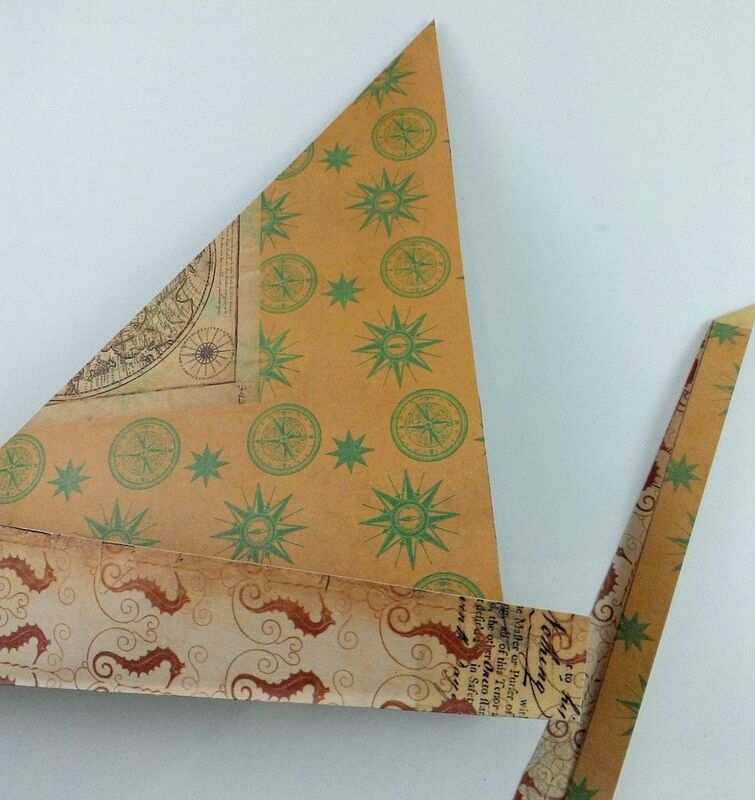 I glued two stars together and colored them with the Patina Gilders paste. 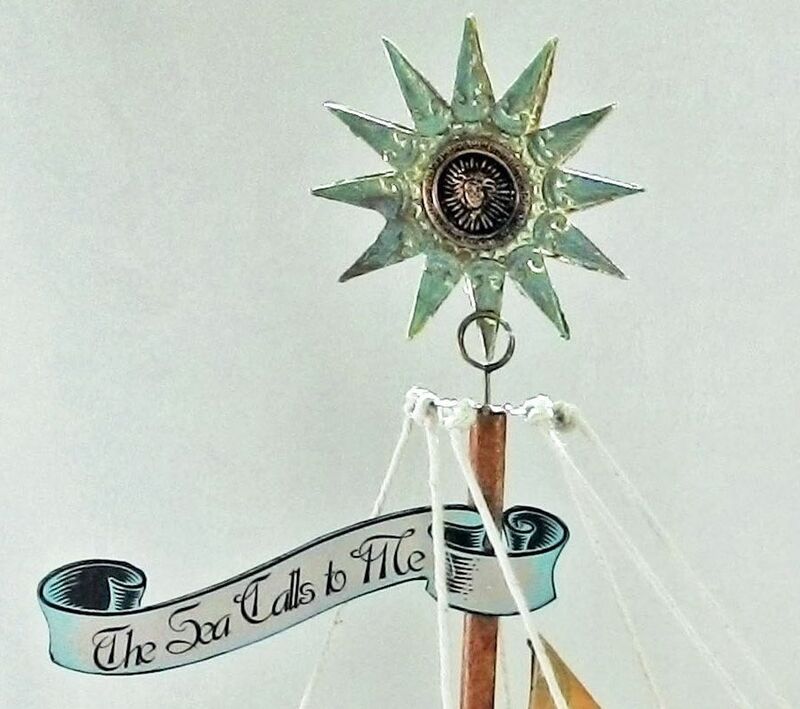 Glued in the center of the stars is a button colored in the same manner as I colored the buttons on the ships wheel. The double sided banner is glued to the mast. To accommodate the other six strings which make up the main sail rigging, I punched 3 holes on each side of the boat. I glued a rondelle on top of each hole. Using a brad, I attached ring handles. Doing it this way means that the ring handles are free to turn making it easier to attach the string and to get the string taunt. I attached lobster claw clasps to the ring handles using a jump ring and then tied each string to the lobster claw. The string not only visually looks like rigging but also functions like rigging to keep the mast and small sail in place and straight. Along the bottom of the boat I used chipboard swirls (you’ve seen me use these on lots of projects) to add the sense of the boat slicing through waves. 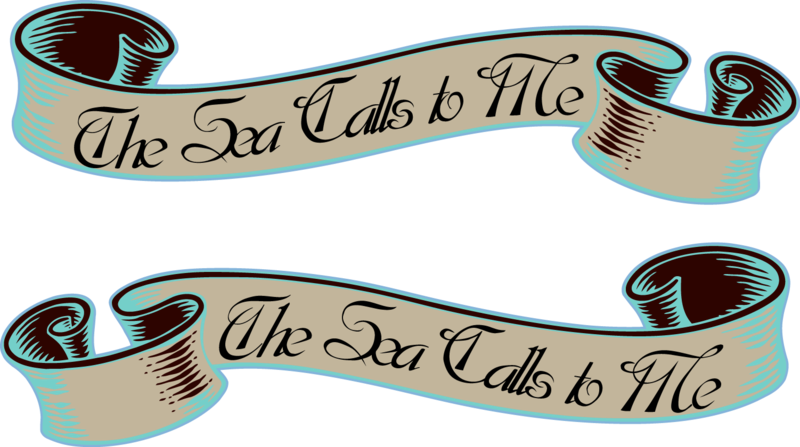 I used filigree pieces to dress up the front of the boat..
Below is the banner I cooked up for this project. There are two so that they can be glued together to make a double sided banner. Feel free to use them in your art. 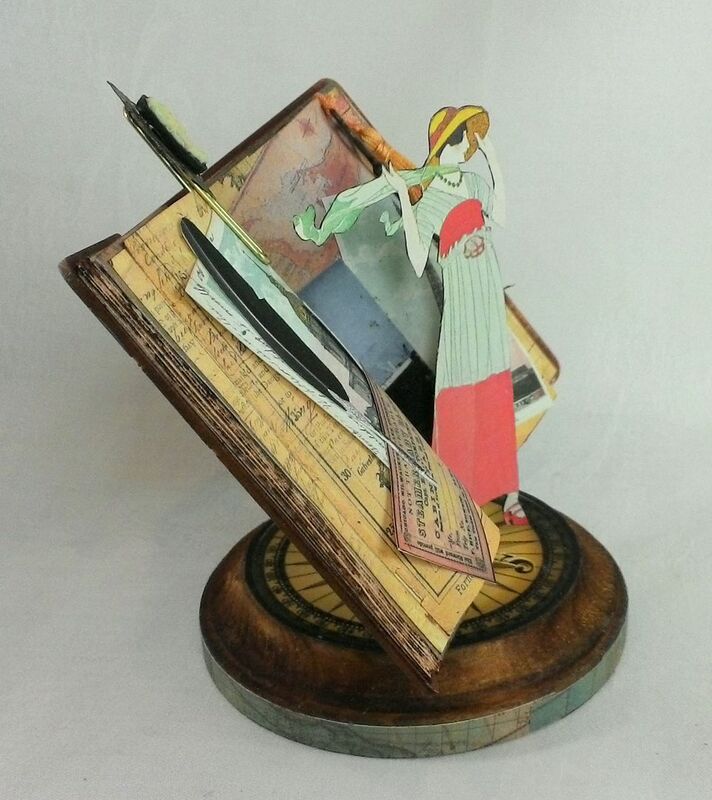 I’ve made many traditional handmade books and journals over the years but this time I decided to take this travel journal in a different direction and create something that was more of a display piece. 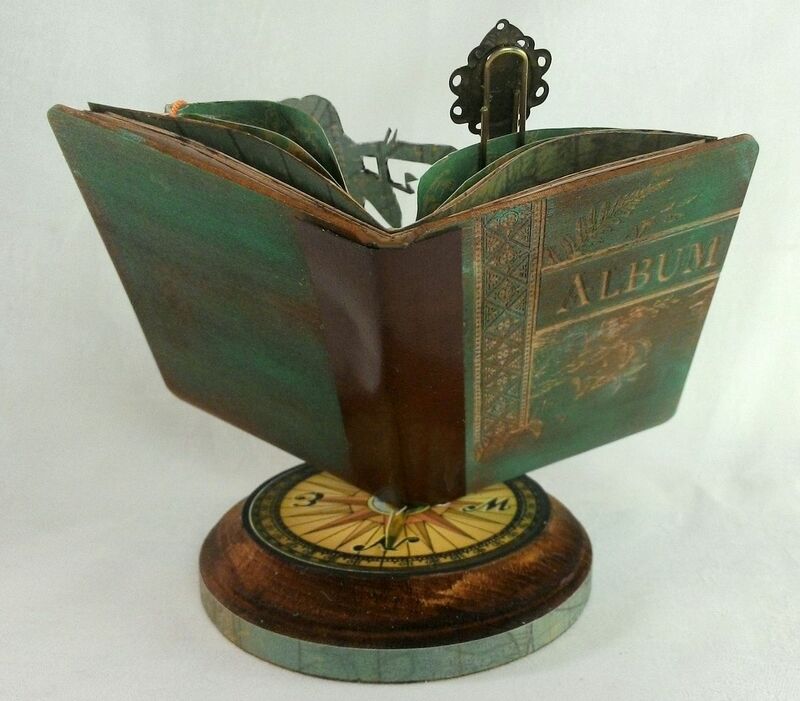 The book is mounted on a wooden base using a wooden skewer with the pages glued in place. 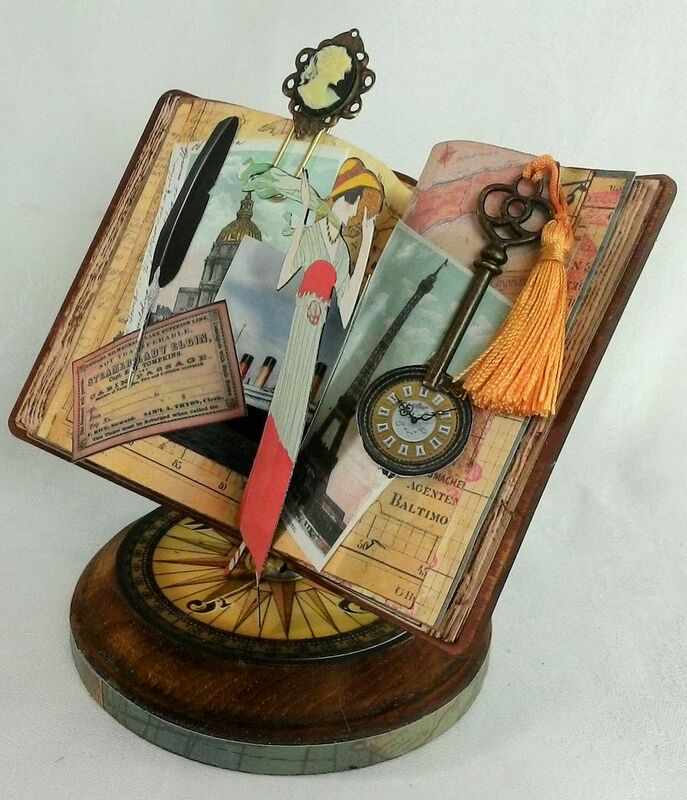 The open book becomes the display area. 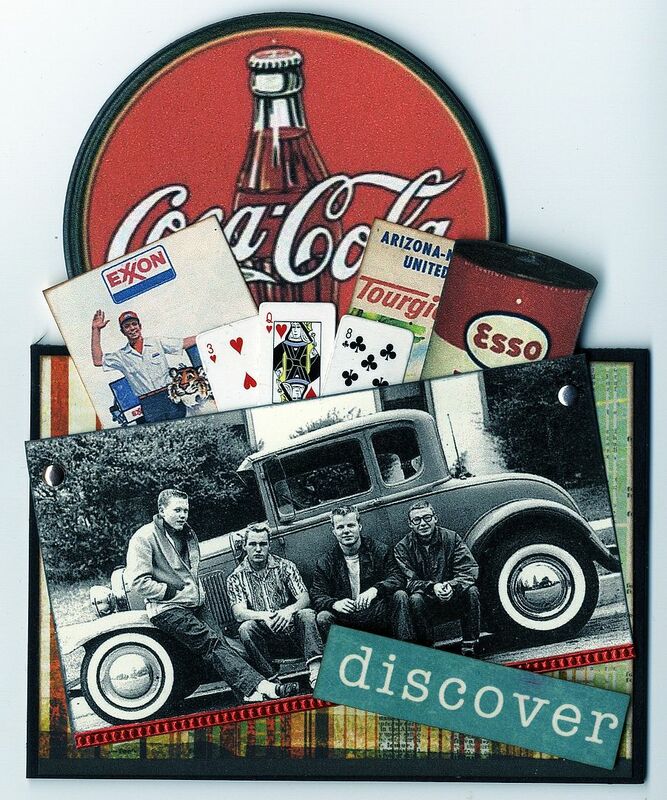 Beyond an art piece I could see doing this with a photo and some ephemera from a real trip. I started by staining the wooden base with Distressed Ink. 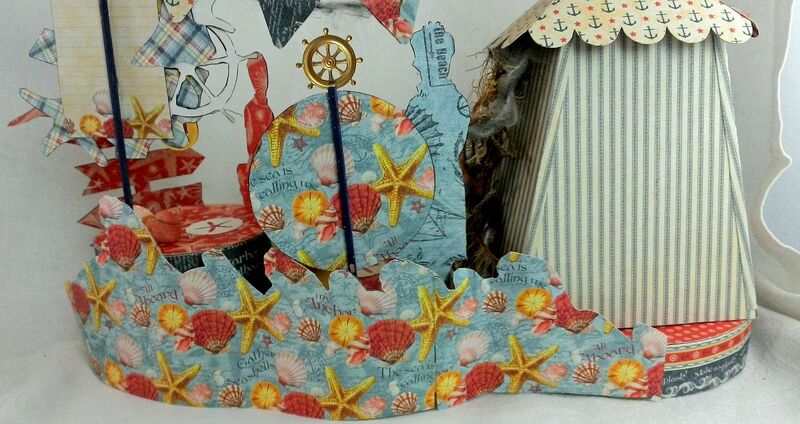 I covered the bottom edge with paper and then use the compass image from my The Sea Calls to Me Collage Sheet for the top of the base. 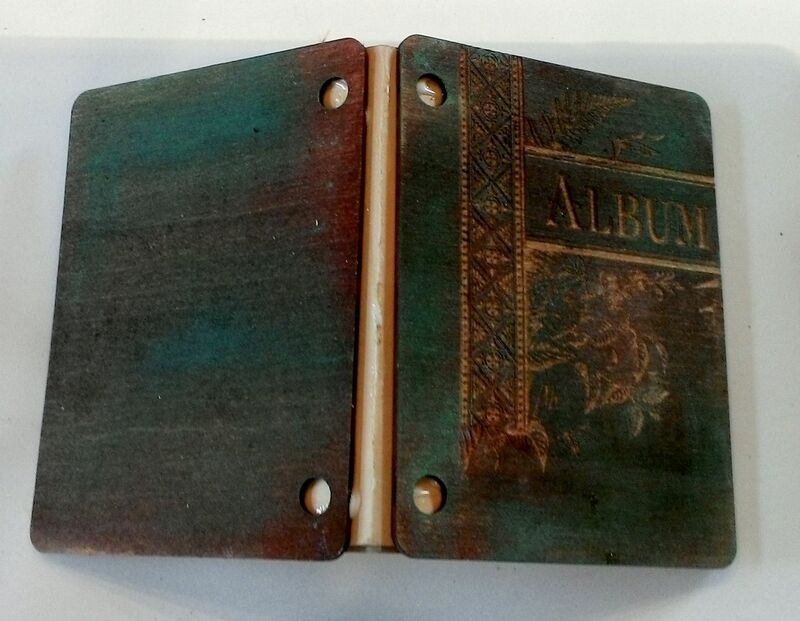 The wooden album covers measure 2 7/8 x 3 7/8” which makes them slightly larger than an ATC. 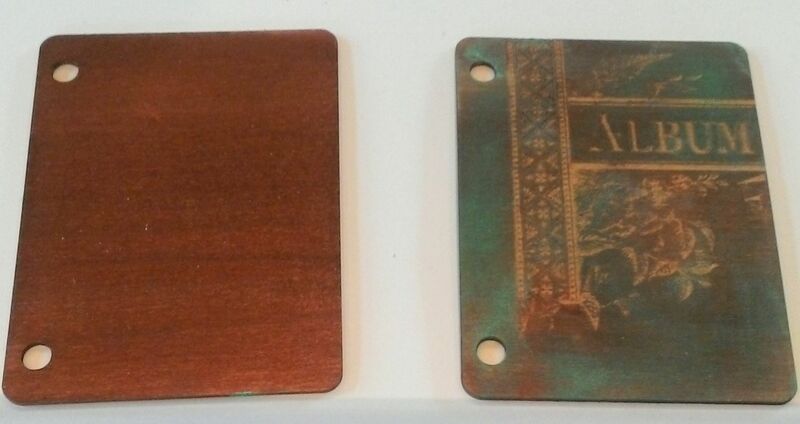 I used Distressed Ink to stain the covers and then Gilder’s Paste to add color. 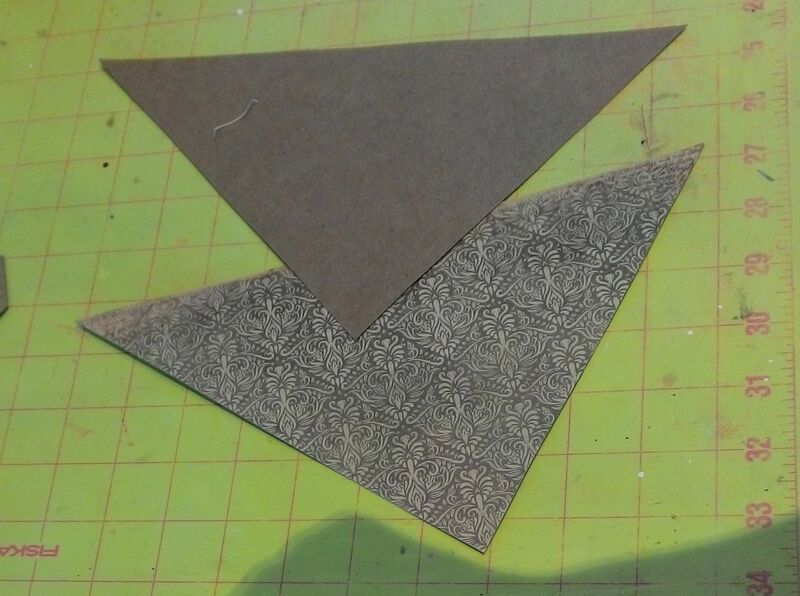 I cut pieces of cardstock and decorative paper slightly smaller than the covers with each page cut (width wise) smaller than the one before it. I inked and distressed the edges of the paper. 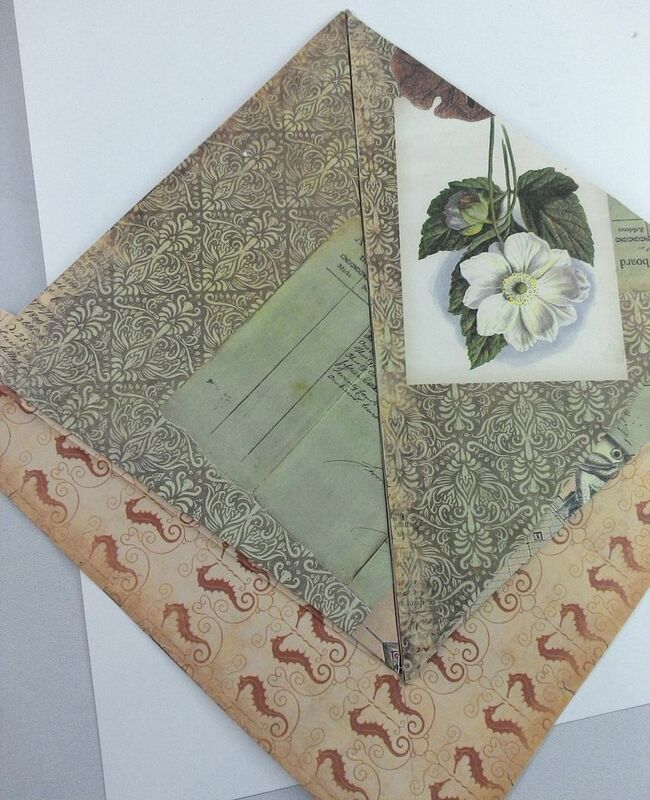 I glued the cardstock pieces to the covers and to each other. In the picture below you can see why I cut each page a little less wide than the one before it. As you glue the folded pages to each other the bulk of the pages will cause the next page to stick out past the one before it if you don’t cut it a little shorter. 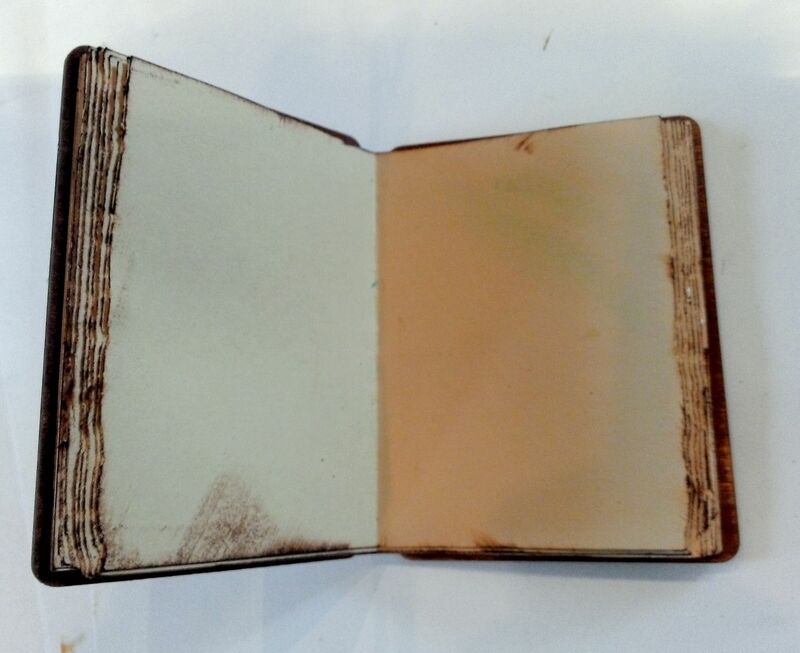 In the picture below, you can see what the book looks like from the back side. Notice the gap between the covers. In the gap in the back I attached a stained wooden skewer. 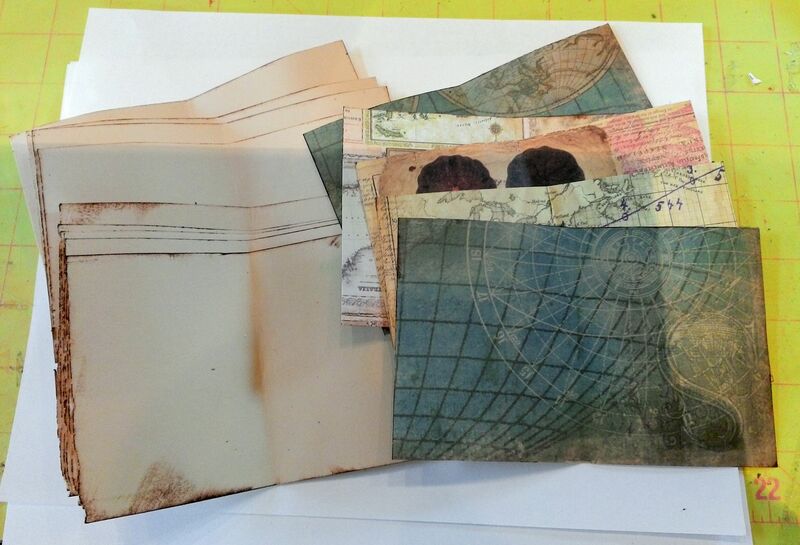 I then added the decorative paper and images to the book. 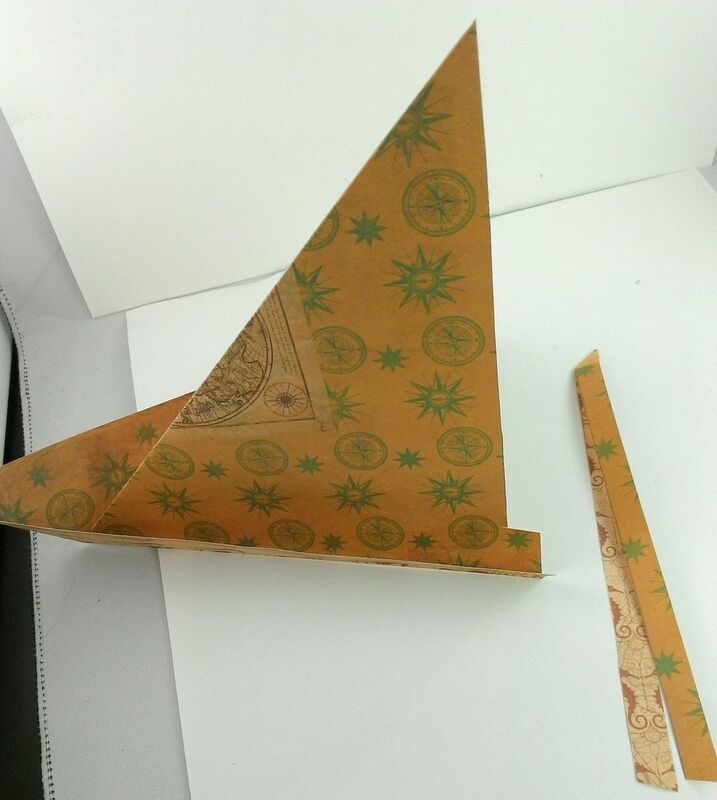 I glued the decorative paper to the book only at the fold. 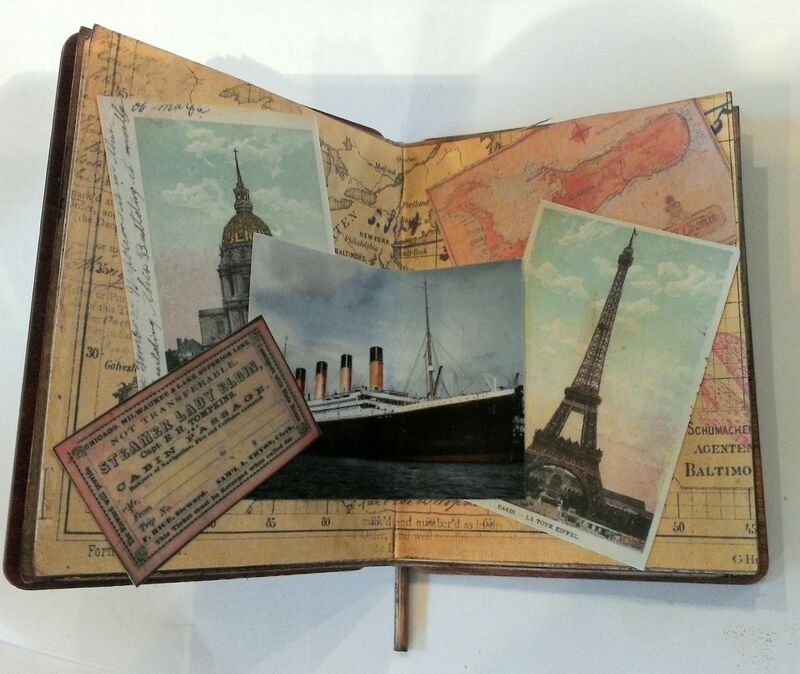 Notice in the picture below how the pages are bowed and then glued in place. You can see why I started by only gluing the paper to the book at the fold. 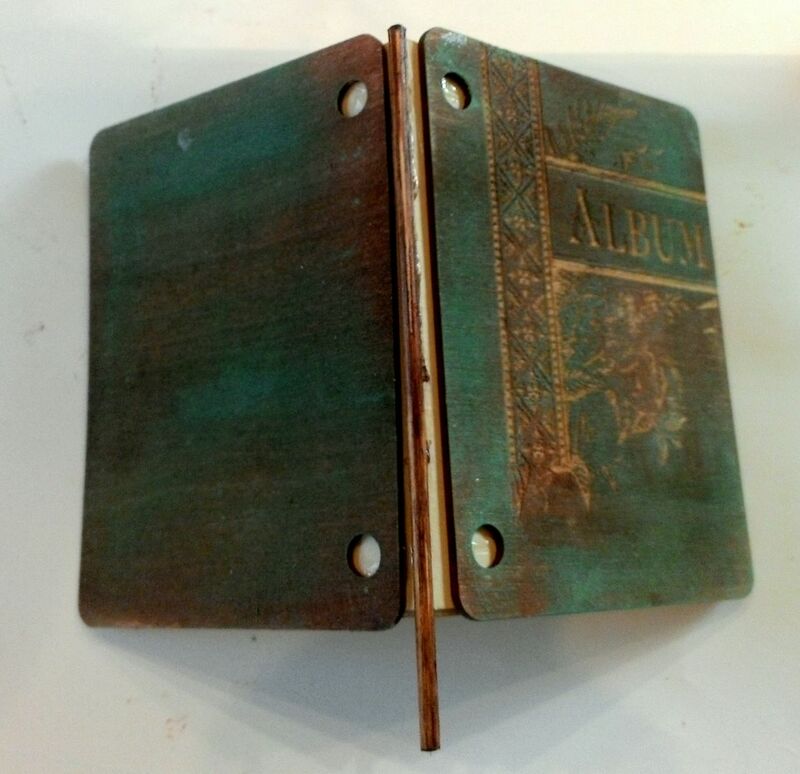 As a spine for the book and to hide the skewer I used a piece of leather paper from my stash. To attach the book to the base I used an awl to make a hole in the center of the base to accommodate the skewer. The hole is at a slight angle so that the book would tilt back. 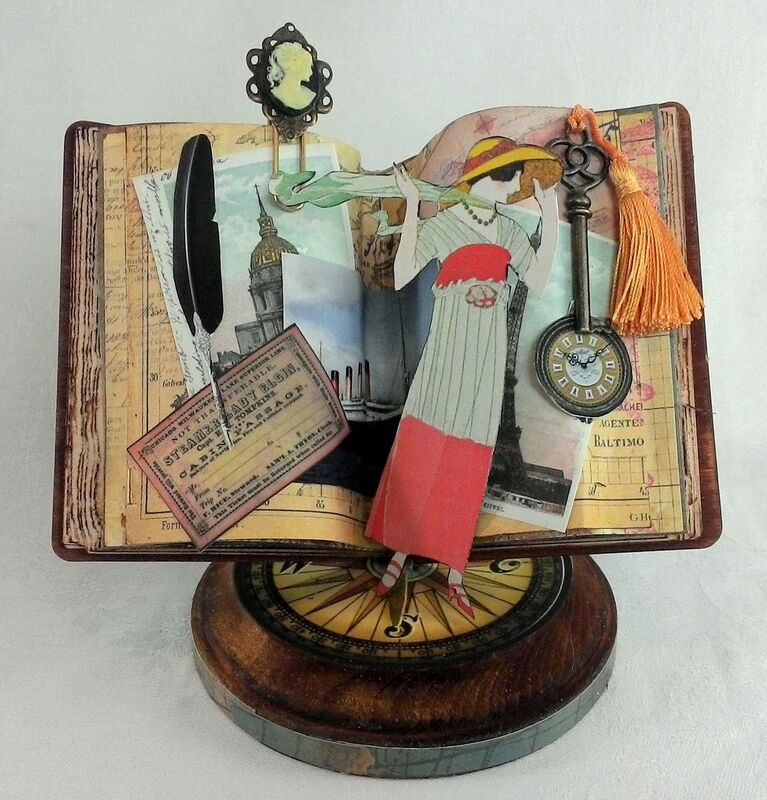 Final touches include a key, tassel, a cameo glued to a paper click and the image of the woman which is standing and glued to the edge of the book. 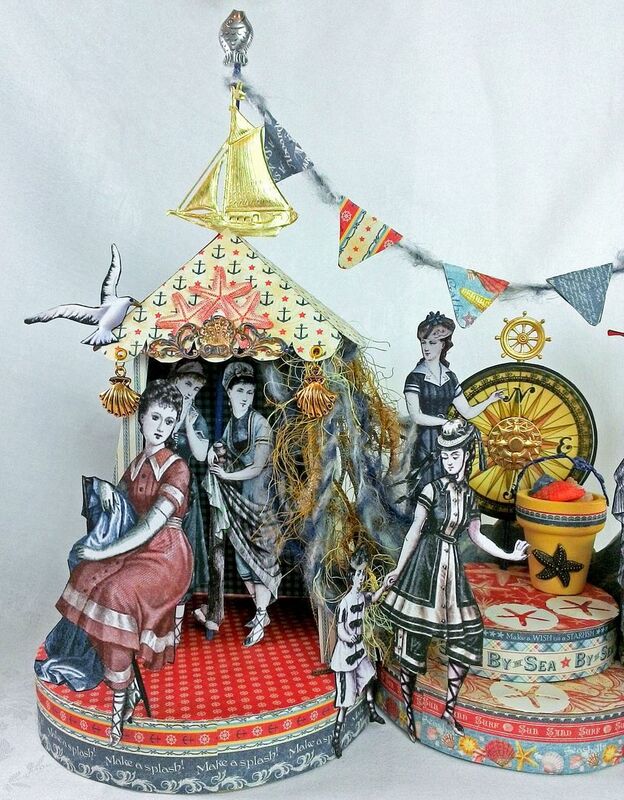 It’s summertime on the boardwalk by the sea in this vintage diorama. 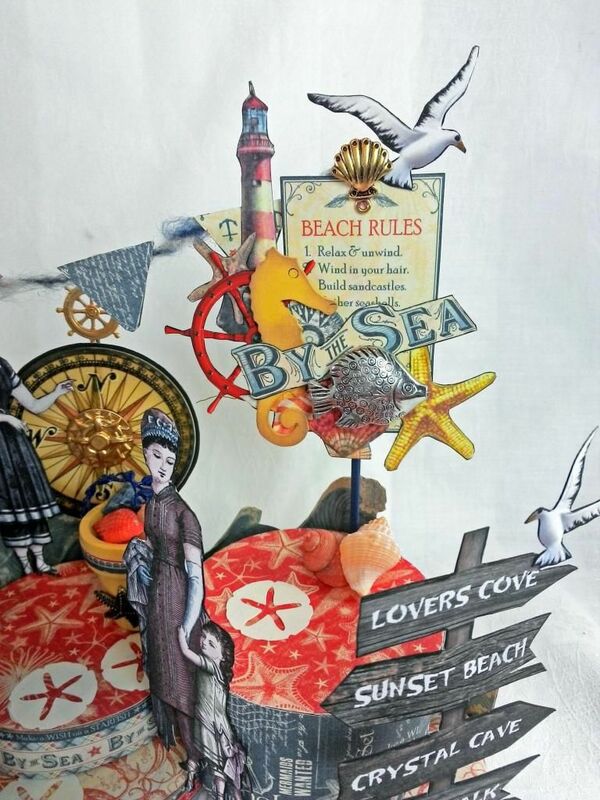 My inspiration came from the new Graphics 45 By the Sea papers and Alpha Stamps Design Team member Jeanne Draachreider new collage sheet “Tinted Beachwear”. I used a combination of one bottom and several lids to create the stair step effect. 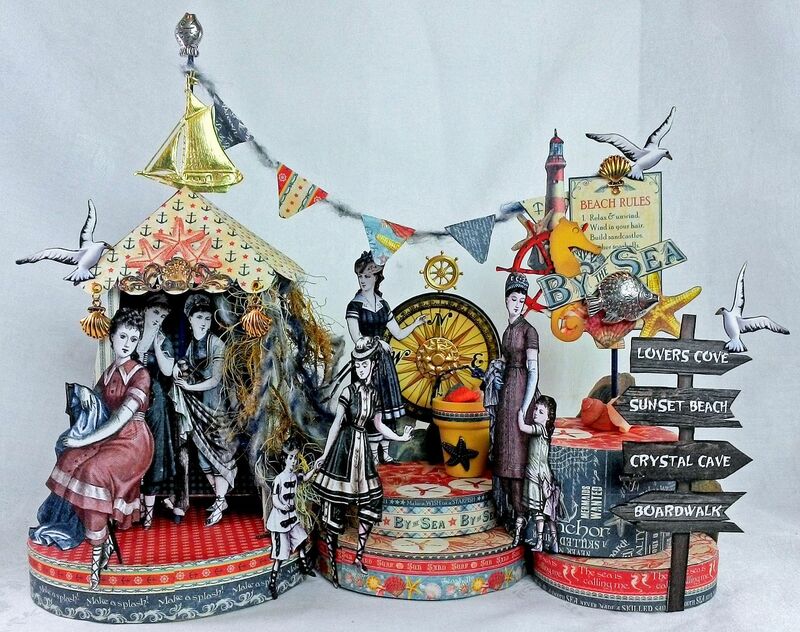 The paper mache is covered with a combination of By the Sea papers. In some, I inserted wooden skewers into the lids and glued them in place. 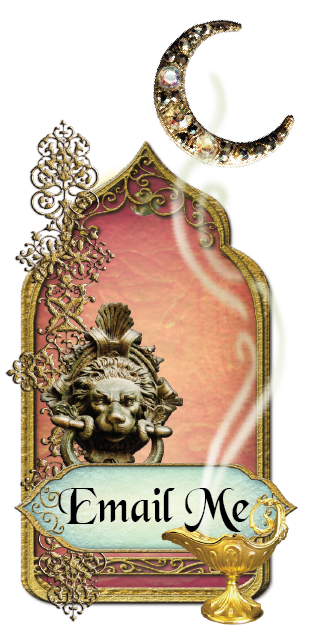 The skewers act as support for some of the elements. 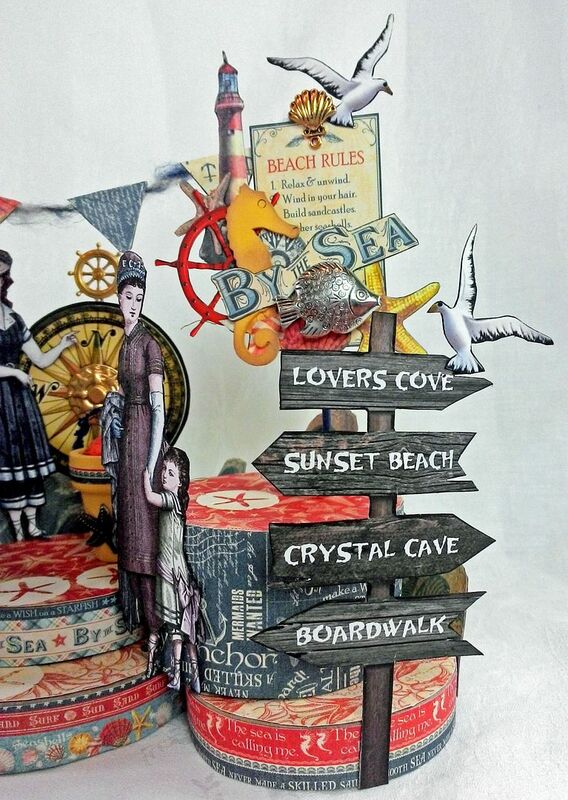 On the left side of the diorama, the beach cabana is the focal point. I used one of the Tent Digital Image sets as a pattern. One of the great things about the set is if none of the color schemes work for your project you can just print and use them as a pattern to create a tent with any color/design scheme. 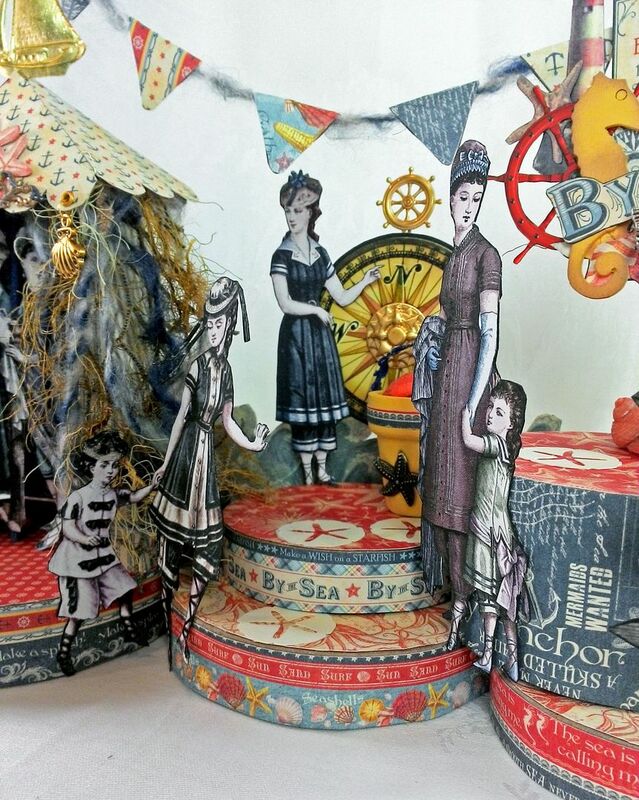 In this case I used them to make a tent from the By the Sea papers. Notice that one of the wooden skewers is the support for the tent as well as a place to attach some of the bathers inside the tent. 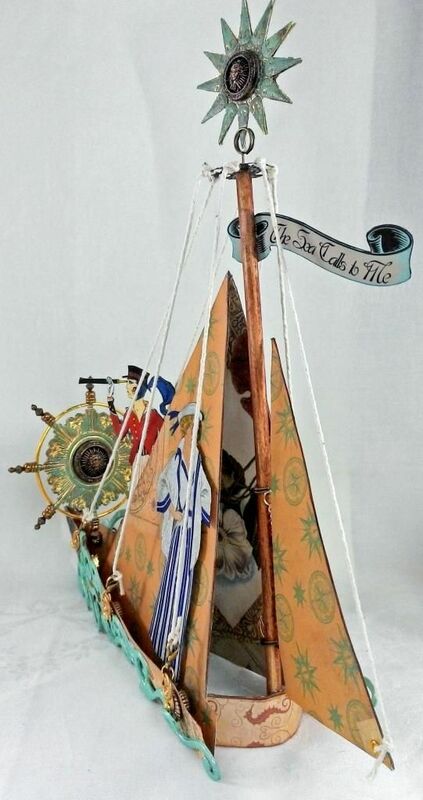 At the top of the skewer I attached a Dresden boat, flags attached to fibers and a fish bead. On the side of the tent I attached netting and wove fibers through the holes. 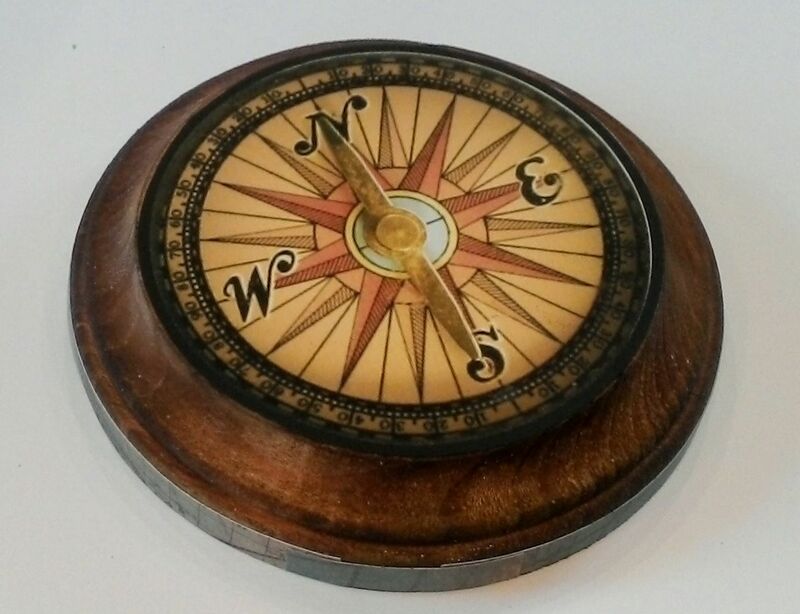 In the center of the diorama is a compass and ship’s wheel attached to another one of the skewers. I used a mini wooden pot (purchased at the craft store) and a piece of brass from my stash to create a bucket for seashells. 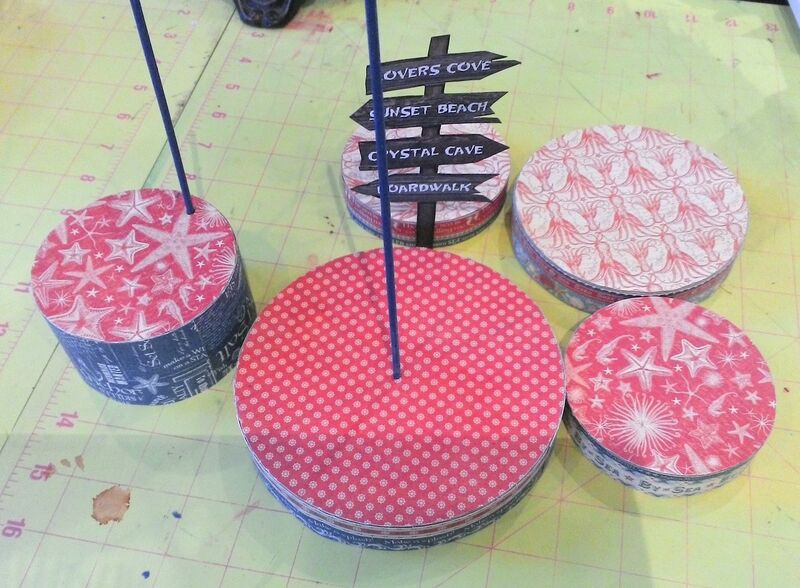 I glued on paper die-cut sand dollars to give the sense of steps and a path up the box lids. 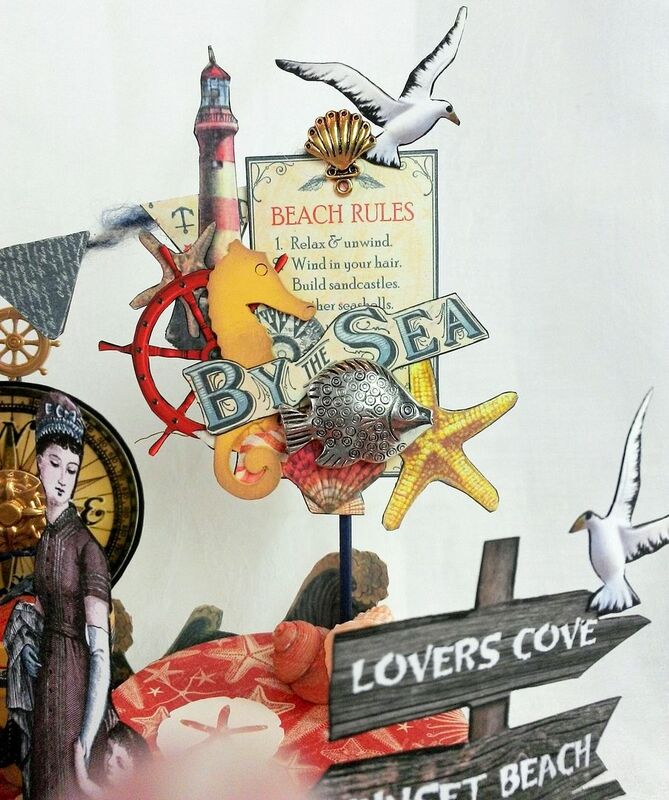 On the right side of the diorama is a collaged “Beach Rules” sign from the papers attached to another of the skewers and a wooden direction sign in front. Note the ocean waves lapping up against the back of the diorama. The ocean waves on the back of the diorama serve two purposes; one decorative and the other to help attach the base pieces to each other (which are also glued to each other).